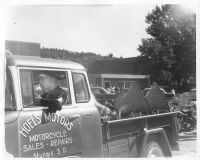 Clarence "Pappy" Hoel purchased an Indian Motorcycle Franchise in Sturgis, SD. The Jackpine Gypsies Motorcycle Club was formed. 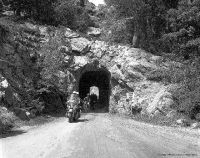 The Rally Begins�The first Sturgis� Rally, known as the Black Hills Classic was held on August 14th with a race of 9 participants and a small audience. For the 1st time, Sturgis Main Street is blocked off for a 2 hour awards ceremony. The Jackpine Gypsies introduce the Hill Climb and Motocross races. One block of Main Street is officially closed for motorcycle parking over the course of the 3 day event. The Rally moves to a 5 day event. The first temporary vendor set up in the Sturgis Auditorium. The Rally evolves to its present 7 day event. The City of Sturgis begins licensing temporary vendors. 9 vendors licensed. City Park is closed to camping due to fire outbreaks. Local man, Tom Monahan, donates the artwork of the Official Rally Logo to the Sturgis Chamber of Commerce. 117 vendors licensed in the City of Sturgis. 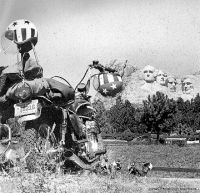 Sturgis� Rally Founder, Pappy Hoel passes away at the age of 85. 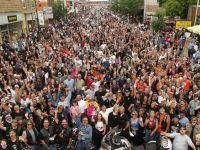 The Sturgis� Rally saw the largest attendance exceeding as high as 600,000 people. 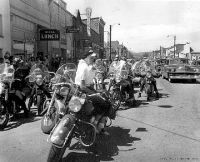 The City of Sturgis formed a city department within the city government to take the place of all prior contract labor hired to promote and organize the Sturgis� Motorcycle Rally�. 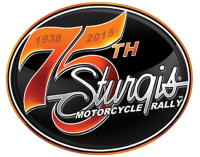 70th Annual Sturgis� Motorcycle Rally� with 466,769 in attendance! Attendance of 445,700 with participants from all 50 states as well as Canada and dozens of other international communities including Japan, Australia, Germany, England, etc. The City of Sturgis is proud to have celebrated the 75th annual event with a record attendance of an amazing 750,000+ participants spanning over a 10 day period.